Install a full soundproof floating ceiling system loosing as little as 5mm ceiling height with our Oscar Iso-Mount Type 1. 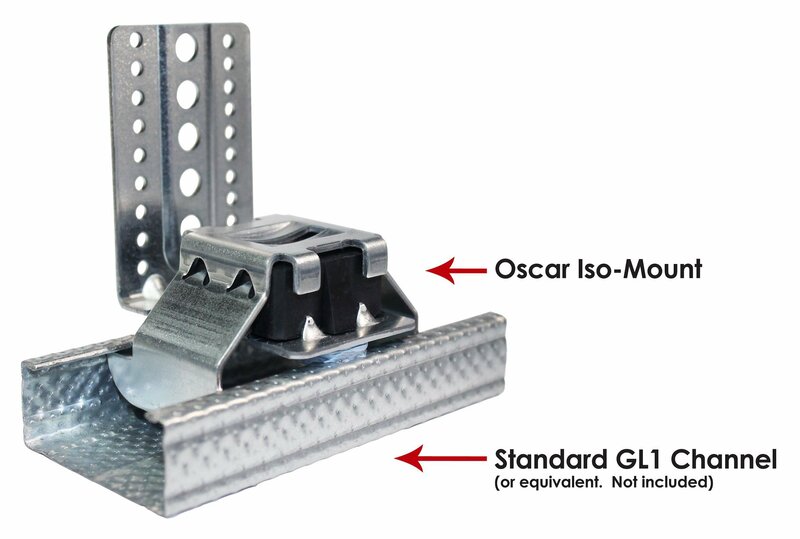 The Oscar Iso-Mount Type 1 is specifically designed for floating ceiling installations onto timber floor joists, working only from the room below, so your noisy neighbours never need to know! Watch our, 'how to install a soundproof ceiling' YouTube video. 1. Remove the existing ceiling, (if refurbishment work), to expose the structural timber joists and the underside of the floor of the room above. Check the condition of the underside of the flooring system of the room above and seal any gaps or holes to provide an airtight seal using Oscar Seal acoustic sealant ref: OAS/1. 3. The magnet shown below is a 27mm dia x 25mm deep pot magnet. You will need at least 2 which we can supply for your convenience; they are very useful tools. 4. Ensure the Iso-Support floating ceiling brackets are fixed so that the level is maintained in all directions. 5. Assemble the floating ceiling Iso-Mounts by pushing the Iso-Rubber into position on the Iso-Saddle - the rubber is held in place by the side guides and the 4 triangular grippers and sits on the raised dimples. Then position the Iso-Saddle (with rubber assembly), onto the base of the Iso-Support Brackets. The Iso-Rubber sits flat and is held in place by 4 triangular grippers and side guides. If you are satisfied that the joists are level, proceed by fixing the Iso-Support Brackets, measuring from the underside of the joist. This can be anywhere between 16mm above the underside of the joist to the underside of the Iso-Support Bracket, (as in diagram 1 above), and 19mm below the underside of the joist to the underside of the Iso-Support Bracket, (as in diagram 2 above). The 16mm above option gives the minimum ceiling height loss of approximately 6mm and the 19mm below option gives a ceiling height loss of approximately 40mm but with more clearance. 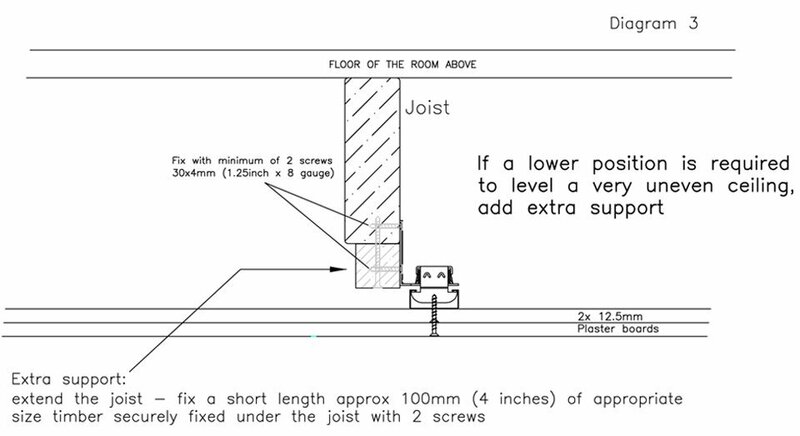 Fix the Iso-Support Brackets 100mm (4 inches), away from the wall and equally spaced at no more than 650mm centres (25.6 inches), if joist centres are 400mm (15.75inches). NOTE: If in doubt fix an additional bracket and evenly reduce the spacing. Identify the lowest position of the lowest joist and mark a vertical line up the side of the joist at this point. Measure 16mm up the line from the underside of the joist and mark a horizontal line. 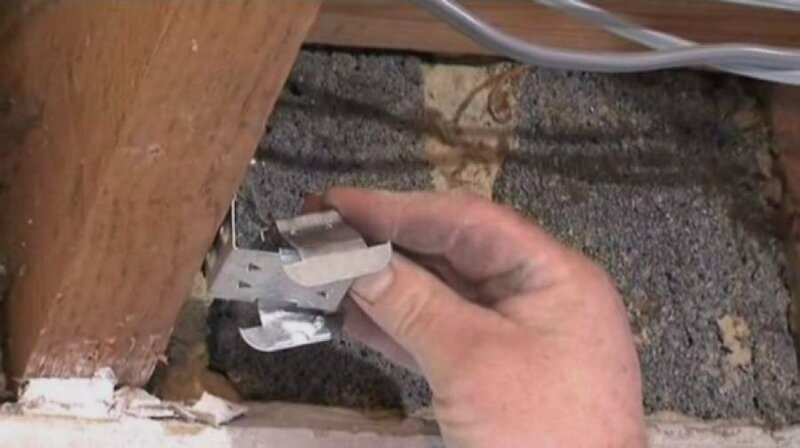 Fix the first Iso-Mount centrally on the vertical line with the underside of the Iso-Support Bracket sitting on the horizontal line 16mm from the underside of the joist; this gives the minimum loss in ceiling height of approximately 5mm, (less than 0.25inch). *Fix lower if ceiling height loss is not critical. 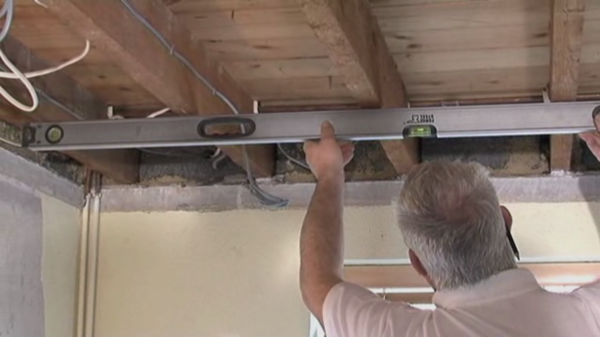 If you have chosen minimum ceiling height loss, the first Iso-Support must be fixed at the lowest point of the ceiling joists: do not fix any Iso-Supports higher than 16mm above the bottom of the joist, as this may allow the sheets of plasterboard (when fixed), to touch the joists and create a path for noise transfer. See diagram 1 above. 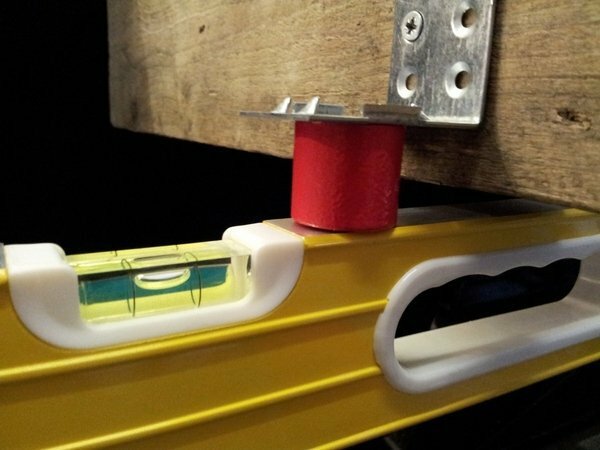 The first Iso-Mount fixed at the lowest point of the ceiling joists is the datum for the height of the remaining Iso-Support Brackets. Taking the level from the underside of the fixed Iso support, (datum), mark a horizontal line along the joist using a long spirit level or laser, marking the positions of the remaining Iso-Mounts: 100mm (4 inch), away from the wall and equally spaced at no more than 650mm centres (25.6inches), if joist centres are 400mm (15.75inches). 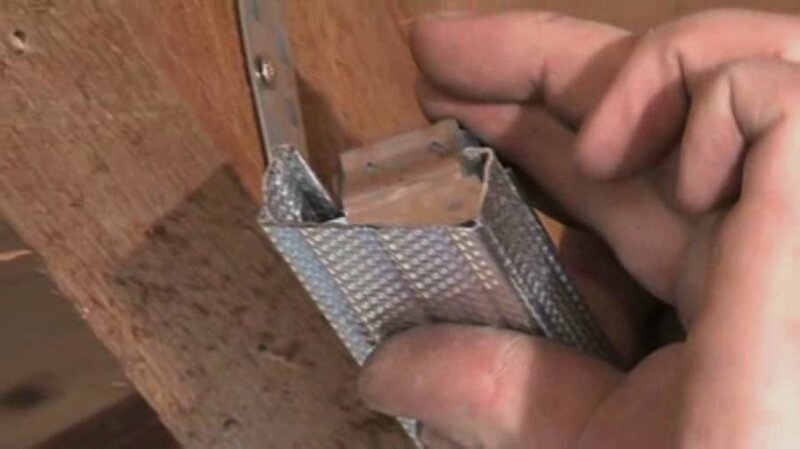 If in doubt, fix an additional bracket and evenly reduce the spacing. 1. 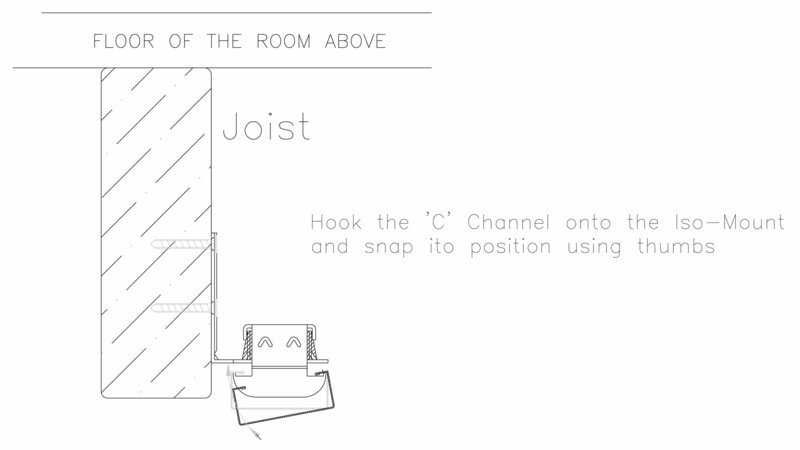 Hook a length of C Channel onto the side, (furthest from the joist), of two Iso-Mounts that are at least 1 metre apart. Then squeeze the C Channel and saddle between your thumb and fingers and the channel will snap-fix into position. 3. The 'C' Channels run parallel to the joists for the full length of the joists. NOTE: The 'C' Channels must not touch the walls as this will create a path for vibration and noise transfer; leave a gap of about 20mm (3/4 inch), between the C Channel and the wall. 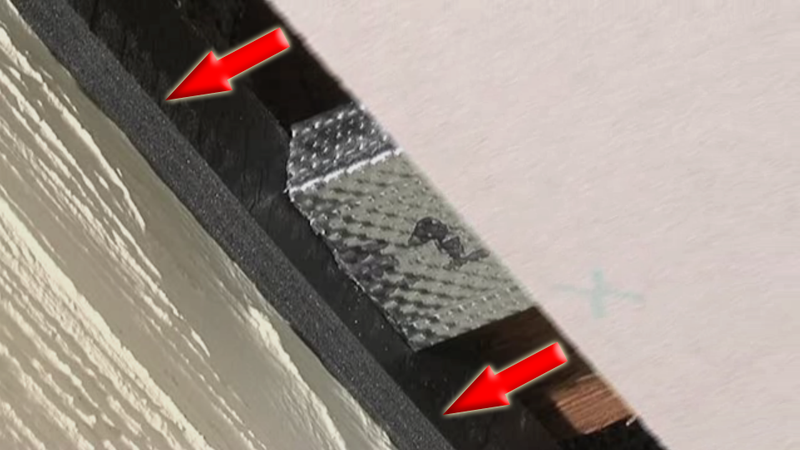 Connection between the C Channel and the wall or joist will mean that the sound proof floating ceiling is no longer floating. The bottom of the fixed 'C' Channel is below the joist by a minimum of 4mm or greater if the loss in ceiling height is not critical. NOTE: under load the Iso-Mounts will deflect downwards by up to 2mm (0.08 inch). 5. The 'C' Channels now provide a floating ceiling grid for the installation of the first layer of gypsum panels. *This fixes around the walls and the plasterboard abuts to it, isolating your soundproof floating ceiling. 1. Mark a horizontal line around the wall at the calculated level of the underside of the floating ceiling, i.e. level with the underside of the lower plasterboard. When using 2 layers of 12.5mm plasterboard this will be 25mm, (1 inch), below the underside of the 'C' Channels. 2. Install 25mm wide x 10mm thick self-adhesive Oscar Foam along this line with the bottom of the foam on top of and sitting on the line. 8. Install 1 layer of 12.5mm (1/2inch) Gypsum board in line with manufacturer’s standard instructions. 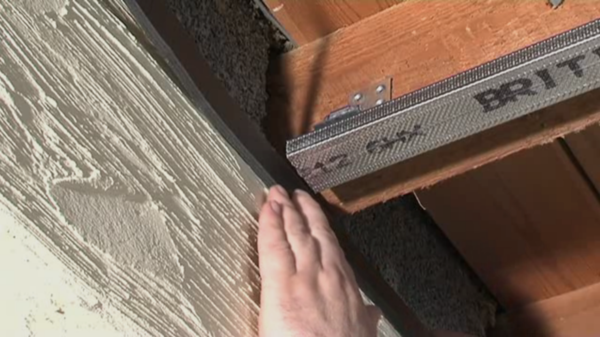 Make sure that the boards around the edge of the ceiling compress the 10mm (3/8inch), thick Oscar-Foam as much as possible: this is to seal gaps tightly but prevent the plasterboard from touching the walls and transmitting vibration. Option 1 - Either the Celbar is packed in by hand by the installer. Option 2 - Oscar Acoustics blow fill it with a specialist machine. For non-UK installations email info@celbar.com requesting the name of your local Celbar supplier/installer. Celbar is manufactured by International Cellulose Corporation with a worldwide network of licensed installers. 1. As the installer fixes the first layer of plasterboard he/she empties bags of loose Celbar and places it in the floating ceiling void by hand as each board is being fixed. Be sure to pack it in tight by hand or with a tool such as a wooden broom head. 2. 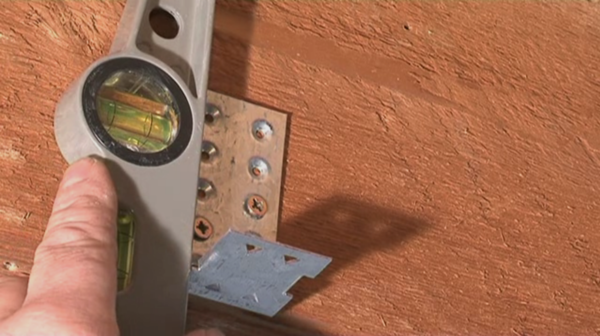 The installer leaves a small section of board to finish; he/she cuts holes 100mm [4 inch] in the board at a position centrally between the joists and fills this last area by hand. Replace the 100mm dia blank into the hole and screw fixing it in position using a short piece of batten positioned above the plasterboard. 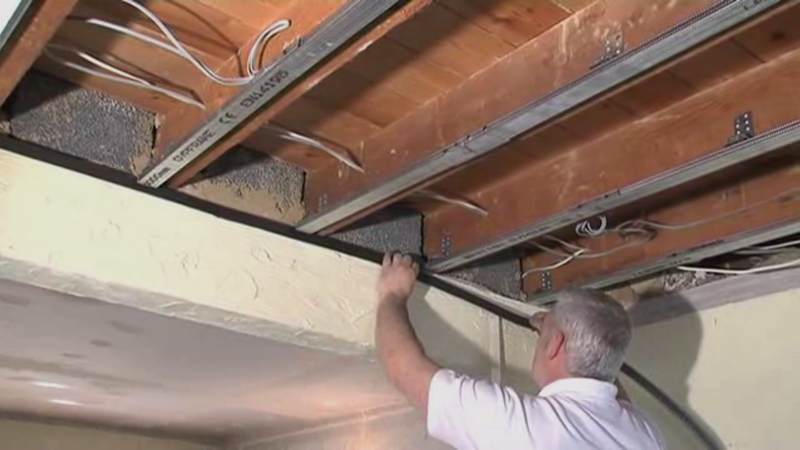 Be sure not to allow the batten or screws used to touch the joists or ceiling sound proofing mounts thus creating a path for vibration travel through your floating ceiling. Use gypsum filler to seal the disc cut-outs and board joints. 3. Apply the second layer of plasterboard; stagger the joints and compress the Iso-Foam but do not allow the boards to make direct contact with the walls. 4. Seal joints, plaster skim and decorate. NOTE: 100mm, (4 inch), holes are not critical, it is just an opening for easy hand access into the floating ceiling; a person with large hands may require a larger diameter hole. 1. With the first layer of plasterboard installed and butting joints sealed, the floating ceiling is now ready for the installation of Celbar by Oscar Acoustics or any licensed installer. This will require holes of 100mm dia to be cut in the ceiling board so Oscar can insert hoses into the floating ceiling. The cut out discs of board are retained. At least 1 hole between each joist, or more if required to ensure the void is full of Celbar. Where noggins split the void space in two, cut holes at either end of the void space. 2. On completion of the Celbar fill, replace the 100mm dia blanks into the holes and screw fixing in position using a short piece of batten positioned above the plasterboard. Be sure not to allow the batten or screws used to touch the joists or floating ceiling sound proofing mounts thus creating a path for vibration. 3. Use gypsum filler to seal the disc cut-outs and board joints. 4. Apply the second layer of plasterboard, stagger the joints and compress the Oscar-Foam but do not allow the boards to make direct contact with the walls creating a vibration path around the floating ceiling mounts. 5. Seal joints, plaster skim and decorate. Celbar loose fill void insulation (as recommended), is also an excellent thermal insulator. Bring this to the attention of your qualified electrician who may have to allow for heavier cables.